At least one NBA player believes the Golden State Warriors are vulnerable right now. According to the Oklahoma City Thunder's Markieff Morris, the Warriors are "beatable." Morris made these comments to Sam Amick of The Athletic just two days before his Thunder lost 110-88 to the Warriors on Saturday night. "They definitely had that air of invincibility (before); I can say that," the Thunder's Markieff Morris told me just two nights before that one-sided, Warriors whopping. "I can honestly say they did. (But) you look around the league, and guys are getting better, guys are adjusting to their game. The style of play they play, they basically changed the NBA, so sooner than later guys are going to start to catch up with the way they're going and they're going to have to change. "I think that's what's happening. Teams are figuring out how to play them different, and they definitely are. Even with Cousins, I think they're a lot more beatable than they were in the past." Although the Warriors defeated the Thunder in convincing fashion, they lost just two nights later to the San Antonio Spurs, 111-105. It's a little concerning because the Spurs are currently slotted as a middle-of-the-pack playoff team. Furthermore, it comes just a week after the Warriors lost to the worst team in the Western Conference in the Phoenix Suns. 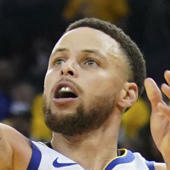 Making matters even worse is that Golden State has gone 6-6 in their last 12 games, which they will try to improve on Tuesday night when they face the Timberwolves (8 p.m. ET -- Watch on FuboTV with NBATV add-on). Despite these recent struggles, Draymond Green isn't concerned at all. In fact, he brought up the most important fact of all -- while teams have proven they can beat the Warriors during the regular season, they have yet to prove they can do so in a seven-game series. "People want to make themselves believe that we're beatable, and I don't blame anyone for that," Green told me while sitting at his locker after the Warriors' beatdown of the Thunder on Saturday. "You should believe that we're beatable and that you can beat us. But at the end of the day, in a seven-game series, you've got to go out four times and prove that. And until someone proves that, they can think what they want." Both Morris and Green bring up valid points. The league is starting to catch up to the Warriors and they're starting to adapt and adjust to their style of play. However, until an NBA team beats the Warriors in a seven-game series, Golden State is far from being "beatable."